BASi MD-2234 MBR-4-10 Brain Microdialysis Probe: 4 mm membrane Neuro Research . New Life Scientific, Inc. 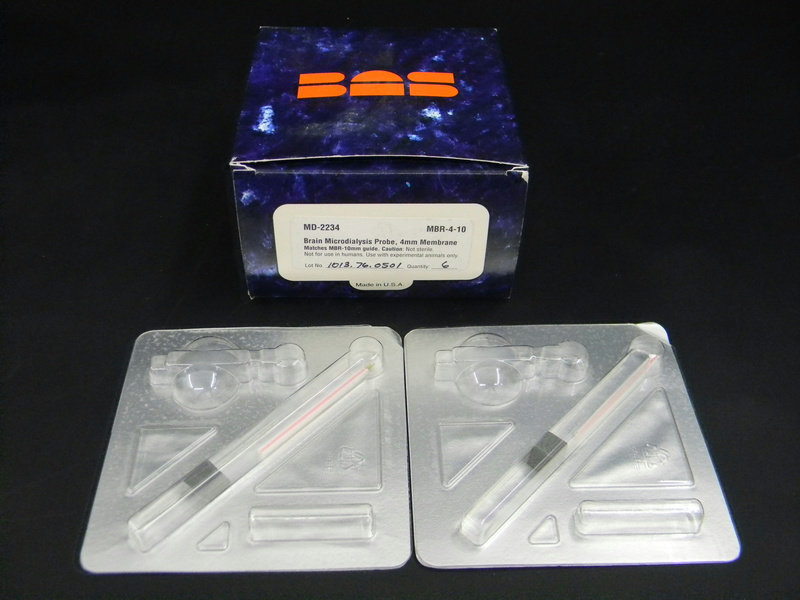 These are new-in-box probes, that was acquired from a US Pharmaceutical Lab. Uses: MBR 10 microdialysis probes are suitable for ventral implants in rats or for multiple implant sites. Use with MBR-10 Guide Cannulae. MBR microdialysis probes can be implanted as close as 2.5 mm on center without a guide or 3.2 mm on center with a guide. The probes have elongated inlet/outlet tubing to keep fingers further away from fast, sharp mouse teeth when connecting tubing. Cellulosic. 35 KDa MWCO. 220 µm O.D.